Suspect melon sold in eight states: Georgia, Illinois, Indiana, Kentucky, Michigan, Missouri, North Carolina, and Ohio. 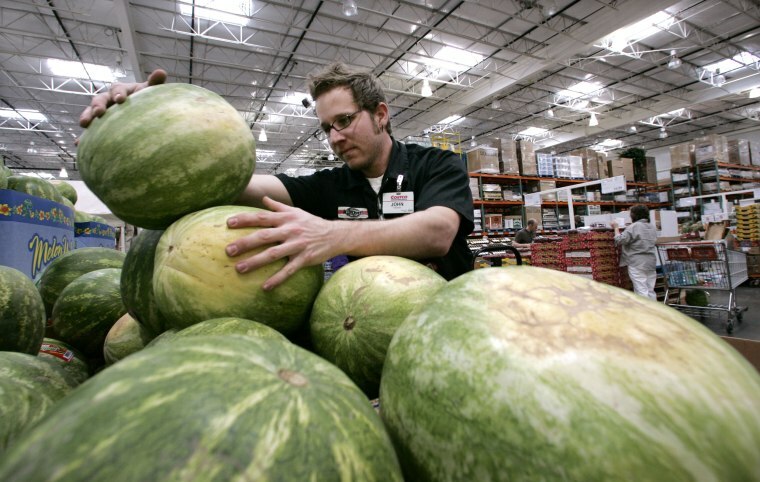 At least 60 people have been made sick and 31 are in the hospital after eating pre-cut melon contaminated with salmonella, federal health officials said Saturday. “Recalled products were distributed to Georgia, Illinois, Indiana, Kentucky, Michigan, Missouri, North Carolina, and Ohio,” the CDC said. People should not eat the recalled cut melon or fruit salad products, the CDC said. “Check your fridge and freezer for them and throw them away or return them to the place of purchase for a refund,” the CDC said. It’s likely more cases will turn up, the CDC said. It can take days or weeks for food-borne illnesses to get reported. So far, people have been reported ill in five states. Separately, the CDC is reporting an outbreak of salmonella linked to backyard chickens that had made 124 people in 36 states sick. The CDC says 21 people have been hospitalized. A third of the cases are in children under the age of 5. Backyard chickens and chicks are a common source of salmonella. “The people who got sick reported getting chicks and ducklings from places such as feed supply stores, websites, hatcheries, and from relatives,” the CDC said. “People can get sick from salmonella from touching live poultry or their environment. Birds carrying the bacteria can appear healthy and clean,” it added. It causes diarrhea, fever and abdominal cramps.